The azaleas died every winter, and every spring Asha would extract the brittle bushes and plant a new set in the same bed. Her husband, Ravi, thought it was foolish. The earth needed to be left barren for a year or two, he’d argued. But Asha had read gardening blogs and even asked the advice of the garden supply center’s staff, who told her to test the pH of the soil. It fell in the normal range, so the next step was to pick another spot and try again. She was obsessed with the velvety magenta azalea blooms that flourished in the spring and the lush green leaves left behind on the bushes in the fall. At times, it was as if she’d found love, a sensation that at sixty-five years of age, she still couldn’t imagine. This spring saw the worst results yet. Never before had all four bushes died. Ravi rode with her to the nursery, insistent she’d need his help carrying the plants. “I’ll be fine,” she said. “I’ve done it before.” In truth, she hated running errands alone. The alternative, however, was not always more pleasant. Ravi could make things impossible. Ravi’s sense of humor was sarcastic and at times, cruel. Asha shrugged it off. She stopped fighting him, realizing how badly he wanted her to need him. Gardening used to be his area of expertise, and now he’d given it up for lazy days on the couch, where he’d inundate himself with stale news, capitulating to lost motivation. The supposition that she would be adrift without his guidance was all the manhood he had left. In the car together, Asha and Ravi listened to Lata Mangeshkar. It was one interest they held in common, Lata’s high-pitched, sugary voice connecting them to the past. Ravi drove, never trusting Asha to do the job. There were so many things of which she had once thought herself capable, but after marriage, the list dwindled. Now she looked toward her daughter Laya’s unending rebellion against her as a model of independence. Asha had never had one in her own mother. She nodded, not wanting to perturb him further. The azaleas were clustered in the far corner of the lot, arranged by color and priced according to their size. Asha knew what she wanted, not orange or white, just the impeccable pink that had provided her with childish delight since their landscaper, Paul, had first planted them a few years ago. She inspected a few bushes, wanting to be sure she picked the heartiest four. Ravi seemed to get involved, lifting a pot and examining it. “Forty dollars for a three-quart container? And you want four of these?” An obnoxiously cheap shopper, Ravi would splurge only on a select few things. As the youngest of five children growing up in an apartment in India crowded with bodies and hand-me-downs, Asha had always worried over money, and so she understood the instinct to scrimp. But now that they’d saved enough to spend as they wished, she loathed his examination of every purchase she made, and the guilt she felt afterward. He grimaced, but one by one, he helped her load the plastic pots into the cart. Neither of them was young anymore, and she could see it especially in the way he struggled with the bushes. But he was still sturdier than her when it came to physical labor. He also had fewer gray hairs—just a speck here and there that made him appear distinguished—while she dyed clusters of silver and white on a monthly basis. Asha and Ravi pulled in the driveway just after four. Asha wanted to plant the bushes right away, while there was still sunlight. But she knew Ravi’s routine. Together, they unloaded the plants from the car and then went inside. She brewed two cups of masala tea on the stove and put out the snacks her husband preferred—fried, crispy puri and spicy peppers that made his stomach burn. He took a few helpings onto his plate. The next day, he’d complain she’d used too much spice. “How’s Laya doing?” she asked. Their daughter had always been closer to Ravi. It was the way of nature—daughters bonded with their fathers, mothers with their sons. Laya was their only child, born thirty-one years ago in a New Jersey town just fifteen miles from Edison, where they now lived. Between tea and dinner, Asha occupied herself with the garden again. She wore the apron Laya had purchased for her last Christmas, even though she had enough old clothes to get dirty. She carried with her a shovel and tugged on her favorite pair of purple floral cloth gloves. Ravi had already unloaded the bushes in the area where she would plant them. She inspected the flowers. The azaleas were not yet in bloom, but there were several buds. The petals appeared so delicate and young, wrapped inside their protective sheaths. In a couple weeks, when the flowers were hearty enough to withstand the variable weather of Northeast springs, they would emerge. For now, she set to planting them in the soil, hoping this set would survive longer than the others. The earth had thawed since last week, when she had transferred the hyacinths from their plastic containers, but it still took marked pressure to cut through the ground and scoop out the rocky brown soil with her shovel. Struggling for a few minutes, she eventually dug a sizeable hole. She removed one of the azalea bushes from its flimsy pot and put it in the opening, covering the roots with the dirt she’d just unearthed. Sweat beaded up on her face and dripped down her neck. The sun was hot on Asha’s long black hair. She’d worn it just below her shoulders her whole life, even though it had thinned over the last few years and lost its luster. Women her age were cutting their hair shorter and shorter so the changes in texture appeared less obvious. Asha didn’t want to surrender this trademark. She didn’t want to follow the rules of aging, or accept what others predicted was inevitable: sweeping irrelevance. One by one, she planted all four bushes. She enjoyed physical labor, seeing immediately its tangible result. The work felt vital and held consequence compared to other tasks with which she filled her day: cooking and cleaning, fussing with store displays at the department store where she’d given twenty-four years of her life. Dirt marked the knees of her pants and the palms of the gloves she wore. Somehow, the stains were pleasing. He shook his head. “It’s not enough in the sun. Look at how dry they are.” He abrasively hit one of the bushes with his hand. A few leaves fell off. back on her, walking up the driveway and disappearing inside the house. In his wake, she felt badly. In his way, he’d been trying to help her and she’d treated him as if he had no place with her, no knowledge to impart. On her own, she surveyed the damage. He was right. It wasn’t just dehydration, however. The branches appeared sickly and snapped easily, and the rich chlorophyll had faded. She felt the despair of death all around her. Her hopefulness, the joy she’d felt in anticipation of the blooms to come, fell away to a familiar depression. At dinner that evening, she informed Ravi of the disaster, certain he could help. He took another ghee-coated paratha and chewed loudly, with his mouth open. The doctor had told him to moderate his butter intake, on account of genetically bad cholesterol levels, but he was stubborn and petulant. Health will deteriorate as it is meant to. Genetics play a larger role than diet ever could, he always said. It was another topic about which they bickered. 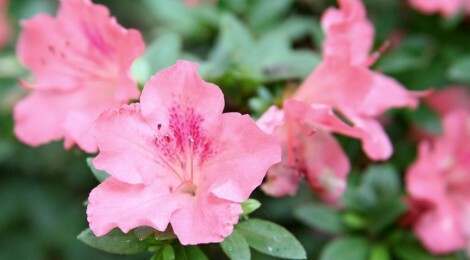 The next day she tried fertilizer—a container of Miracle-Gro especially designed for azaleas and rhododendron. She mixed the concoction and sprayed it onto the bushes, praying it would provide the boost they needed. Afterward, she washed up. Laya had invited her and Ravi to dinner. It was a half hour away, and they were to be there by seven. They arrived even later than that. Ravi had to finish watching the evening news. It was his routine and there were few things that could make him stray from it. When they arrived, Laya and Josh were hard at work in the kitchen. “We made Mexican,” Laya said, hugging each of her parents with the happy warmth she’d always demonstrated toward them. Ravi made a face. The only food he enjoyed eating was Asha’s home-cooked Indian meals. In the kitchen, Josh was chopping onions for the guacamole. Asha watched, envious of the way he helped her daughter. No task was unsupported; they worked as a team. “How many margaritas?” Josh asked. He’d prepared a full pitcher already and was counting glasses. Ravi shook his head. “I don’t drink.” He repeated this often, despite the fact that everyone, including Josh, already knew this about him. “I’m okay,” Asha said. She enjoyed the occasional drink, but in the absence of another woman her age, she felt embarrassed by it. “You’ll like it,” Laya said. Dinner was pleasant, the conversation full of the laughter that was absent on nights she and Ravi ate alone. For his daughter, Ravi showed many facets of himself he did not share with Asha. Watching him, she suppressed her jealousy. The man in front of her was one she could have easily loved, an old friend she remembered but had never fully known. This man was always available to others in their life, but never to Asha. Every day after work, Asha checked in on her azaleas, hopeful the Miracle-Gro had reversed their decline. But the health of the bushes had faded further, leaving the branches brittle, the leaves yellow and dry. She couldn’t stand the thought of another dormant season after the frigid one they’d just endured. It was time for re-growth and renewal. Rebirth. Nature didn’t comply with her demands. Temperatures dropped over the weekend, making it unseasonably cold. Asha placed stakes in the soil around the azaleas, rhododendron, and the tulips, and then covered each with a breathable cloth. She and Ravi stayed in, as well, occupying themselves with household chores and other mundanities that accompanied domesticity. The news was on nearly the entire weekend, headlines scrolling like advertisements, anchors repeating their analysis in the voices of mindless drones. If only he’d once asked her if she’d like the remote or a change of channel, she might’ve chosen something lighter, something that had life to it. On Monday morning, she went in to work as usual. All day, she thought of the garden and when she came home, her spirits were further deflated. The bushes were as lifeless as the ones she’d pulled out of the ground in early April. She sat on the front step considering how next to proceed. Across the driveway, their landscaper Paul and his team were planting a new tree. A weeping cherry, identical to the one she parked under every evening. Paul had done a lot of business in this development over the last ten years, reaping the benefits of casual referrals relayed between neighbors. The desperation on her face must’ve been detectable across the distance, because within moments, Paul came toward her. She rose, walking toward the end of the driveway where they converged. “It’s looking good,” she said, motioning toward the neighbor’s yard. “It’s about time, don’t you think? I wish they’d let us strip the whole thing and really do our job.” A handsome man of forty-five or fifty, Paul maintained a thick head of hair. No grays, just the comforting chestnut brown she’d always found to be boyish and lush. “We would love it.” The neighbors were friendly, but peculiar. In seven years, they had yet to put up any blinds. Their yard was full of dead grass and tall weeds. “We’re doing great. For the most part.” She thought of showing him the azaleas then. But she was enjoying the warmth of his attention. She didn’t want him to see the damage she had done and scold her. The lines in his forehead grew deeper. She averted his eyes, suddenly nervous. He snapped off a piece of one branch and then dug his right hand into the soil, scooping it. “It wasn’t you.” The dirt sat in his palm. Nothing appeared out of the ordinary. But as he rubbed it with his fingers, separating the sediments from each other, she noticed the rich brown heap was dotted with clumps of white. “Fungus?” She crouched toward him to examine it more easily. That weekend, she began the process. Despite her relief and satisfaction in identifying the cause of the azaleas’ deterioration, she couldn’t shake the guilt. She’d killed one plant after the next, blaming it on variables like an extremely rainy season that brought floods, or the depth at which she planted the bushes, or the piles of winter snow that coated the plants well into March. But it was her neglect. Nothing else. For dinner, she and Ravi chewed okra and sipped dal. Reluctantly, she shared her the news about the plants. There was no reason for him to be abrasive. She wondered if there’d been an incident in the last few years that filled him with contempt toward her. Or was it simply that he’d grown bored of her mannerisms, the way she had his? “Well, he offered to help me. Very generous.” She couldn’t stop thinking about Paul since their encounter. When they’d parted, he’d lightly touched the top of her hand with his fingers, as if to stop her from leaving. The delusions of her imagination ignited girlish fantasies in her mind. She wondered how it would feel to be with Paul, his tan, rugged hands running along her body, the fulfillment she’d feel in his arms. What it would be like to be cherished, loved. Ravi offered no more than a grunt in response. They ended the evening as they always did, on separate corners of the couch, the television blaring sensationalized headlines. As daylight broke, Asha found herself restless in bed. She woke even earlier than usual and dressed in an old pair of blue jeans. She went into the yard, prioritizing the spring flowers she knew would be thriving: the rose bushes that had been fickle across summers, never dying but always producing mediocre blooms alongside luscious, tear-shaped leaves half-eaten by beetles, and the rhododendron bushes that sat over four feet tall. Reluctantly, she approached the azalea bushes and began what she assumed would be a full day’s work. The morning sun hit her at the perfect angle. It surged, electric and all-powerful. She removed her sweater and left it folded on the porch. No longer stifled, she dug furiously, hopeful her resolve alone could speed the process. Soon spent, she paused and tried to steady her labored breath. Then she began again. An hour passed this way. Ravi finally awoke and promptly left on errands. She continued in the garden, steadily making progress. A short time later, Ravi returned. Hanging from his hands as he walked toward her were four grocery bags that pulled his body toward the ground like a weighted scale. “What for? We’ve isolated the issue. I just need to extract the infected soil and remove the bushes,” she replied. He took the bags inside and left her alone. Even in his absence, Asha could feel his disdain. He thought she was stupid, squatting awkwardly in the dirt, attempting to build success where for years she’d had none. Maybe what she was doing was foolish. But she couldn’t let go. She hammered at the ground again, scooping up the white chunks of soil with the tip of the shovel. Free of the bags, Ravi emerged from the garage. “No tea today?” he said, looking down the path toward her. Was that the real reason he preferred she abandon this project? To assuage his feelings of neglect? The tea sat in her stomach, strangely heavy. She was used to the thickness of chai, unlike her coworkers who were surprised or complained when they tasted it for the first time. Even the British and Irish tea drinkers preferred a couple spoonfuls of milk, not half a glass. Though she was worn, the unearthing of the sickly bushes remained a priority. After teatime, she returned to the garden. She tried to pull one of the bushes from where she’d planted it, but it was already firmly rooted. She continued to dig, figuring it would be easier if she cleared enough space around the base. Then she laid her shovel against the porch, clasped her hands around the sturdiest branches, and began to tug. But just like her, the azaleas were stubborn. The bush did not come up with her hands as she pulled. She let go, regrouping before she could try again. “Can I help?” Paul stood just behind her, his collared shirt dusted with dirt, his gloves muddied and stained with grass. “I didn’t mean to startle you,” he said, his smile extending through his chapped lips. Paul squatted next to her, gripping the left side of the bush. Together, they yanked on the lifeless plant. Asha infused more strength into it than she had before, not wanting to appear feeble. A simulated battle between mutual obstinacies—the plant would never give up its home as the reluctant fungus stuck to the soil, and she and Paul wouldn’t relent until they’d removed it—until the tension shifted in their favor. She lurched back from the transfer of momentum, which left the azalea bush in both their hands like a rope pulled from their opponents in a tug-of-war. Able to retain his balance, Paul steadied Asha, his gloved hand against her back. “I had no idea.” She was certain she was blushing. They carried the drab bush, which was still attached to clumps of affected soil, to the compost bin in the garage. After they dumped it in, Paul helped her scoop up even more of the surrounding dirt from the plant bed to ensure they’d excavated all of the moldy growth. “I can come back tomorrow. Help you remove the rest?” The blue-gray of Paul’s eyes softened. “I would appreciate it,” she said, trying to suppress her excitement at the offer. After night fell, Asha sat with Ravi in front of the television. Her body ached from the earlier exertion and though she felt tired, she wasn’t sleepy. She read as he flipped between programs until finally, he turned to her. “It was just a small thing. Nothing to be upset over,” she said, all too aware that he said this only in retrospect, that the initial answer would’ve been the same: there’s no point in working so hard for these azaleas. They’ll never do well here. The next day, Paul helped Asha dig up the remaining bushes and infected clumps of dirt. The new mixture of mulch and soil he’d suggested was added and then they gave the earth a chance to acclimate to all the changes they’d imposed. Over the next couple weeks, the neighbor’s weeping cherry brought soft pink flowers and Paul was able to convince them to add a few potentilla shrubs, which infused dozens of joyful yellow flowers into the otherwise dismal palette of faded green and dusted brown that characterized their patchy grass. After a few days, Paul and his team moved on to another job and the azaleas remained unplanted. Hours at the department store intensified for the annual Memorial Day sale. The worst part wasn’t coming in early or standing on her feet for an extra shift, but the plethora of coupons the store had distributed to customers. The number of arguments born from misunderstandings escalated that weekend, during which she had both Saturday and Sunday shifts. When she returned home from work on Sunday afternoon, she was pleased to see Ravi out in the garden watering the barren beds of dirt and mulch where the azaleas used to be. The tulips were cheerful in the sun, wide open and welcoming. Fatigued in a way only age could describe, she prepared for the second half of her workday: first tea, and then a home-cooked dinner. Ravi would balk at anything less. The next week, Paul returned. He brought with him four new azalea bushes. The effects of spring were intensifying, the warmth of the afternoon sun almost unbearable, cut only by the cool evening winds. She worried it was too late in the season to add new life to the garden, but he assured her that it was a simple transfer, not like embedding seeds, which had to be cultivated at the opportune moment. As they began digging, they spoke about the new job Paul had taken on, how much of a privilege it would be, as the couple was young and interested in a different aesthetic, more English countryside than the stock suburban landscaping he’d recreated for most of his career. “It’s hard to stay motivated when faced with routine,” she agreed, wanting to share more details about what she meant, but uncertain it was appropriate. They worked for a little while longer; one bush was planted, a small, but sweeping moment of victory. Paul and Ravi exchanged some banter, manly musings on the housing market and global warming and other buzzwords they’d heard on the news. Then Paul continued digging alongside Ravi. They coordinated their efforts as Asha was pushed aside. “Sorry again about the trouble you’ve been having,” Paul said, dusting off his hands on his jeans when they were finished. “I told Asha it was a fungus weeks ago,” Ravi boasted. “Well, now you know what to look for.” Paul lifted the shovel off of the ground and told them to call if there were any further problems. Then he walked down the driveway and climbed into his truck. Left with her husband, Asha felt conflicted. After months of his absence from the garden, she should’ve been elated that he’d come to join her. What she felt was unexpectedly opposite. Ravi helped her sweep up the dirt and empty the trashcan. He promised to take the bags to the dump the next day. He was overly attentive, more helpful than she’d asked for or needed. After having a taste of it, she longed for the autonomy she’d felt with Paul. The chance to be whomever, because he didn’t expect her to be anyone or anything specific. For dinner, Ravi suggested they order pizza. Maybe he felt it too, the fatigue that comes after an epic struggle. “Are you sure? I don’t mind cooking,” she told him, worried he’d find some way to later complain about her night off. “I’m in the mood for a slice of pizza anyway. Maybe two,” he said, already dialing in the order. The staff at Luigi’s delivered the pizza within the hour. It arrived steaming hot, the way Ravi best enjoyed it. At the dining table, they ate in silence, but it was comfortable in its way, not as gnawing and harsh as in the past. Now that the decay had left the soil perhaps this year, there could be flowers still, bright magenta ones that would open healthy and full and sweep away all of the lifelessness that lived in the past. Cheerful renewal, again and again, for years to come. A Jersey Girl now living in Southern California, Avni Shah continues to be inspired by fashion, food, and her experiences growing up as a first-generation Indian-American. A graduate of the University of Southern California’s Master’s in Professional Writing program, she has had non-fiction and fiction published in various literary journals and blogs. Her first novel, The Arrangement, was a quarter-finalist in the 2012 Amazon Breakthrough Novel Contest.